Uber drivers in Quebec will now be required to undergo 35 hours of training as opposed to 20. Quebec's transportation minister is renewing a deal allowing ride-hailing company Uber to operate for another year in the province. Laurent Lessard says the deal extension tightens the rules under which the San Francisco-based company will be permitted to continue offering its services to Quebecers. 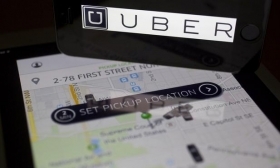 He told a news conference Friday that under the new rules, background checks on Uber drivers must be conducted by the police and no longer by private companies. Additionally, Lessard says all Uber drivers will be required to undergo 35 hours of training as opposed to 20. Uber has been operating legally under a pilot project created roughly one year ago despite strong opposition from the traditional taxi industry, which has lost significant revenue since the ride-hailing company entered the market. Included in each Uber fare is a small sum collected by the government and dedicated to helping the traditional taxi industry modernize. Lessard says the money collected from the program totalled about $7.2 million over the course of the pilot project's first year.